This is the recipe I started with, but I changed some things…my version follows this one. 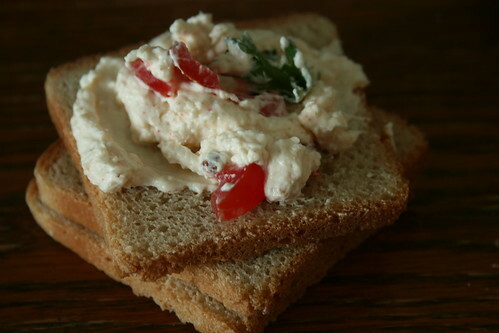 In a small mixing bowl, combine the cream cheese, sour cream, mayonnaise, bouillon and cayenne; mix well. Cover and refrigerate overnight. Spread cream cheese mixture onto a 10-in. serving plate. Sprinkle with Parmesan cheese, bacon, tomato, swiss cheese, chicken and parsley. Serve with crackers or chips. Well, here I go changing recipes again…but I wanted a lot more than this recipe makes. So here’s my ingredient list. I combined all ingredients in my mixer, except the tomato and parsley which I reserved to sprinkle on top when ready to serve. I made the cheese spread the day before the party. I even prepared the tomato and minced the parsley ahead of time. I stored them in little ziptop bags. About an hour before the party, I put the cheese spread in the serving dish, sprinkled the tomatoes and parsley on top, then loosely wrapped it in plastic wrap and returned it to the fridge until time to put it on the table. I wanted to serve it with bagel chips, but there were none at the store. Remember…I live in a town with a Wal-Mart and an Aldi’s. Not much choice available. We have to drive an hour to get to any kind of large store. So we used four kinds of crackers for the party. Hearty, snappy crackers. I bought little bread loaves in the deli to use, too, but didn’t serve them after all. But the cheese spread was delicious on them the next day. What little there was left. 🙂 Thanks to my friend Susan who brought this recipe to our Home Extension Christmas party two years ago and who graciously shared the recipe with me! This entry was written by ~~Rhonda, posted on December 17, 2009 at 5:40 pm, filed under Christmas, Recipes and tagged three cheese spread. Bookmark the permalink. Follow any comments here with the RSS feed for this post. Post a comment or leave a trackback: Trackback URL. I loved the sound of the recipe till I came to the chicken/turkey! I would have left it out too! Cheese doesn’t spoil out on the table for awhile … but those ingredients could!